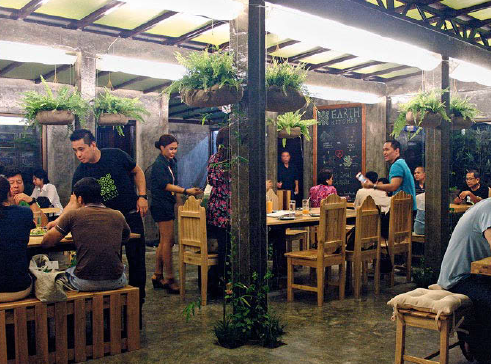 Find out how this new restaurant concept helps spur greater demand for local organic harvest. Like its predecessor, the foundation’s eponymous Got Heart Shop, Earth Kitchen was built from a refurbished skeletal structure—an old, rundown trellis. “What we wanted to do was up-cycle everything and integrate nature as much as we could,” says Yeung, pointing to the converted space’s use of natural light, indoor plants, and re-purposed wooden pallets. It’s not the only thing they have in common. 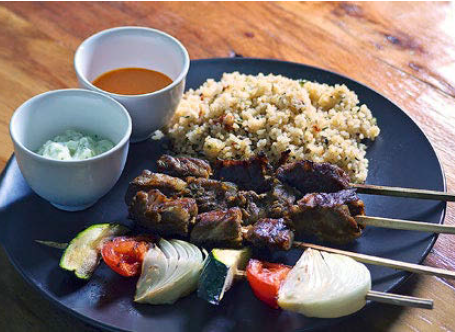 Located along White Plains in Katipunan Avenue, Earth Kitchen is within walking distance from Got Heart Shop, its main supplier, which sources products from more than 100 social enterprises and grassroots businesses. Its dishes are specifically crafted using ingredients that are also available at the store—primarily rice, vegetables, meat, honey, cheese, and milk—but despite their close ties the two are in different leagues, says Yeung. The milk and cheeses that are for sale at the Got Heart Shop, for example, are instead served as gelato in Earth Kitchen. The success of one complements, not cannibalizes, the other: Earth Kitchen’s main purpose is to spur more demand for their farmers’ homegrown harvest, while its sister business enjoys a windfall. Previously, Got Heart Shop owed most of its profits to walk-in customers and select restaurants, but the launch of Earth Kitchen last year has “added a layer of regular sales for the shop” that helps stabilize its operations. In February, Earth Kitchen introduced a selection of dishes that features the seasonal produce of the foundation’s partner communities from all over the country. It’s charting unknown territory by exploring indigenous food culture, but Yeung welcomes the challenge. “Indigenous communities don’t do massive production, and we understand their situation,” she explains. These additions to the menu are also meant to accommodate their farmers’ surplus produce, helping relieve the burden of having to sell them elsewhere.